Don't we Malaysians love our rice? Anytime, any hour, practically for any meal and whenever we wish? Of course. Undeniably. Me too being the number one rice lover. I basically love rice to every bit. Rice is my sincerity. Cooked white rice, paired alongside side dishes, and sometimes elevated or heightened to another level spiraling level in regards to a few ingredients or generously (Nasi Lemak, Ghee Rice & Nasi Dagang) or how about leftover cooked white rice? Effortlessly converted to fried rice (Malaysian Fried Rice, Tom Yum Fried Rice, Lamb Fried Rice, Chinese Fried Rice & Kampung Fried Rice). No. No. Not the exact previous Anchovies Long Beans Fried Rice though. Never. Never will I repeat showcase the same recipes over and over again. This Nasi Goreng Ikan Bilis notably is the other, another version to nava-k's making fried rice. Perhaps a couple of similar ingredients, has to be right? We can't do away with the customary ingredients right? I doubt. I don't think-tank we can. This Nasi Goreng Ikan Bilis (Anchovies Fried Rice)? 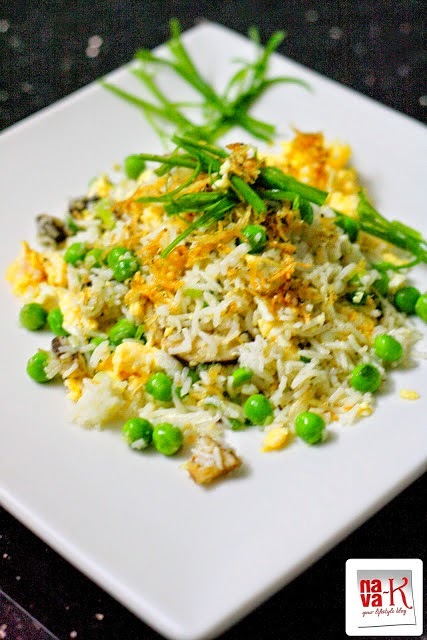 Anchovies, mushroom, eggs, peas and spring onion. Keep this recipe on stand-by, you should, just in case it will be your turn to a lazy Sunday or any day cooking. Heat enough oil and then break eggs in. Scramble into small pieces, remove and keep aside. Put in rice and mushrooms. Quickly stir and add peas, scrambled eggs, fried anchovies and spring onion. Stir again prior to dishing out. This dish looks absolutelly delicious! Great colors!!! Nava, did u change your camera recently? This shot is awesome! This serving of fried rice will be wiped clean rather quickly! I normally throw in some chopped chili padi since I prefer a tad of spiciness in my fried rice. Oh,,,Nava,as you know I'm a big fan of Nasi goreng, You tempting me with this version sound very tasty with ikan bilis,,,great pic too,love it !! Your picture here does look very magazine worthy Nava! I have yet to have breakfast and since this has eggs in it-I say it qualifies. Delicious post! wow the fried rice looks so good.. I love to eat fried rice a lot.. somemore ikan bilis fried rice. Hi Nava, What's up? It looks very delicious. I followed you on blogger, please follow me back. Thanks.. I love the shot of that fried rice.. making me hungry now! Stunning photo! Fried rice with anchovies is my favorite, Nava! It is such a delicious way to enjoy left-over rice! I saw this recipe in a cookbook, yours turned out very good. This is one of my favourite rice dishes. Last night I has some at the 1945 Restaurant Pyrmont in Sydney - it was spicy and delicious. 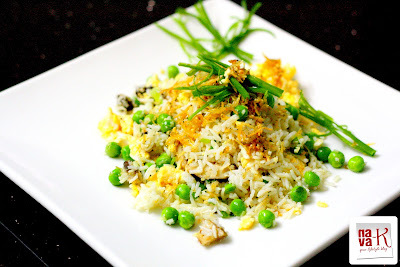 I love colourful fried rice.. especially the one with cubed carrots and green peas!! hi nava, your nasi goreng bilis looks sooooooo delicious, especially with the eggs and scalion...hmmm, cant wait to try this, i think its the prettiest anchovies fried rice i have ever seen. have a nice day. I've had nasi goreng before and this looks lovely. Eggs and onions on the top are always a winner! ohh wow...absolutely love the super tempting fried rice !!! !never made fried rice with anchovies be4...definitely a must try !!!!!! Oh Nava, I am a rice person and your dish is made for me. It just look so pretty with peas and scrambled egg and green onion. I feel like making it today but I don't have anchovies. Simplicity is best! I enjoy ordering a plate of Ikan Bilis Nasi Goreng at our mamak stall here. It's really tasty! Me and my husband love nasi goreng! Your picture is really stunning! Fried rice is always my favourite too,not only for eating.For cooking too...Good way to use leftover rice and even for a quick one pot meal!